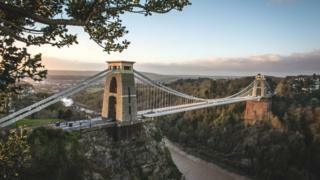 Bristol has topped the list of the "best places to live in Britain" in a new guide for 2017. The city has been named as the UK's most desirable location in the Sunday Times Best Places to Live Guide. Described as "a small city that feels like a big city", it was praised for being "handily placed for seaside and scenery" but "hardly cut off". But it said, with lots of "glamorous, creative, hi-tech and professional" jobs on offer and "great" food and drink - the city "crams in all the culture you could wish for". Sunday Times home editor Helen Davies, said: "The city is a worthy winner thanks to its ideal combination of extraordinary culture, impressive schools, buzzing culinary scene, exciting redevelopment and community spirit. Mayor of Bristol, Marvin Rees, said he was "chuffed" the city had been recognised. "Pinpointing what makes Bristol special isn't easy," he said. "It's a combination of many things from the people to the place itself, but at the heart of it is our cultural diversity and independent spirit."